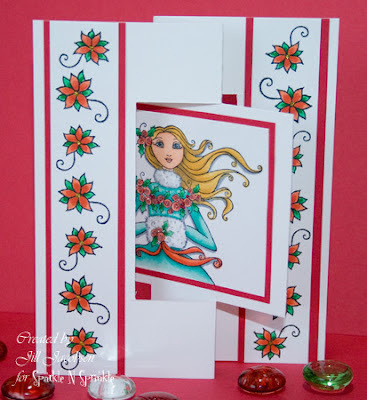 I made my Video Kit Club this month and I used the new stamps from Michelle Perkett that will be released on Thursday, July 12.....you get a sneak peek!! I just love her images and they are soooo much fun to color with Copics!! 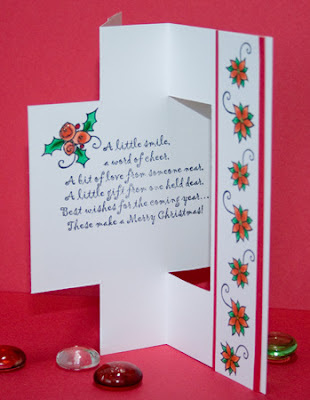 The focus on the club this month is the card cut, it's call a Swing Flip Flop, and it looks a lot more difficult than it really is....You can watch the video here on how to cut your cardstock. Make sure to mark your calendar for Thursday's blog hop....you may win if you leave a comment. Love it Jill. Couldn't get to the video to see how you did it. I'll try via SNS! Such a lovely and fun card. Just love to make flip-flop cards. Great ideas. Alice L.
Here is that cutie, Woofie again decorating a beautiful card. I like the use of the blue with the red along with the fluffy white snow.